"The North American Aviation F-100 Super Sabre was a sleek, swept-back-wing fighter that gave the United States a supersonic Air Force. Although the first version was produced prior to 1950, various improved versions served as trainers and as active military craft at many U.S. and foreign bases. Since May 1953, when the first prototype model, the YF-100, bettered the speed of sound on its first flight, the versatile fighter set numerous records for speed, endurance, range and maintenance. Late production models of the F-100D and F-100F had the capability of being launched from remote areas in the manner of manned missiles. An F-100D Super Sabre became the first supersonic aircraft to be "boosted" airborne without use of a runway in successful Zero Length Launch (ZEL) tests at Edwards Air Force Base, Calif., in 1958. 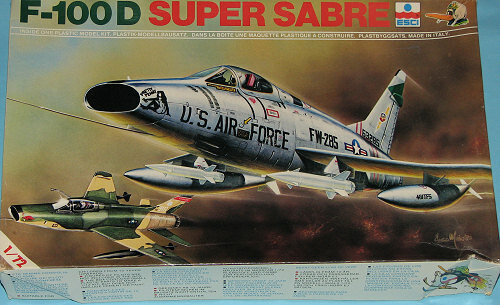 In addition to its nuclear bomb armament and four 20 mm cannons, the Super Sabre could be equipped to fire rockets and missiles, including the heat-seeking GAR-8 Sidewinder. While the later models of the F-100 had a speed in excess of 1,000 mph, two earlier models of the "A" and "C" established the world's first low level supersonic speed records. Colonel F.K. (Pete) Everest reached 755.149 mph in October 1953, and Colonel Horace Hanes topped 822 mph in August 1955. To demonstrate the ability of its pilot and aircraft, the Air Force chose F-100 Super Sabres to perform throughout the world in aerial precision demonstration flights. The famed "Thunderbirds," a four-man aircraft team, were viewed by over 19 million people as the storied pilots performed intricate precision maneuvers at low altitude. In Europe the "Skyblazers" flew similar demonstrations. The jet fighter was originally powered by a Pratt & Whitney J57-P-7 axial-flow engine. Later models of the F-100 were powered by a Pratt & Whitney J57-P-21A engine. Both were two-stage turbojet engines with afterburner, rated in the 10,000-pound thrust class. The F-100 had a service ceiling above 50,000 feet and a range of more than 1,000 statute miles. In addition to the thin, highly swept wing and tail, the F-100 design incorporated other features that reflect an answer to the problem of supersonic flight. Heat-resisting titanium was used extensively throughout the plane. A low-drag, ultra-streamlined fuselage and canopy with but one thin-lipped air intake duct helped make supersonic speed possible. The canopy line matched the rear fuselage in a smoothly curving line so that from the side, the Super Sabre appeared to be slightly arched. Other features included automatic leading-edge slats and a low-positioned one-piece horizontal stabilizer. The F-100 was the first USAF airplane to utilize the low tail. The plane had an automatically regulated air conditioning and pressurizing system and automatic fuel system. Particular attention was given to placement of all controls, equipment and instruments in the cockpit for ease of operation." Most of you know that ESCI went out of business in the late 1980s and was purchased by AMT/ERTL, itself now part of Racing Champions and no longer doing aircraft kits. 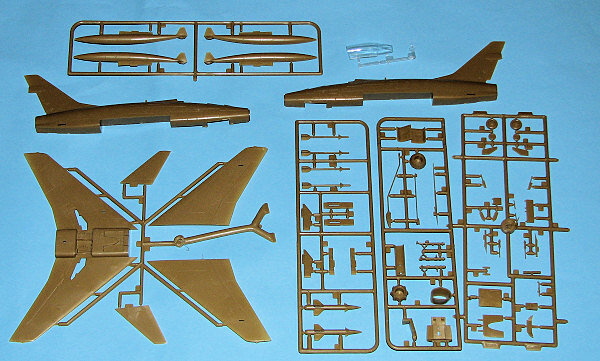 However, ESCI was very much doing aircraft kits and lots of other types as well. One of their better kits was the 1/72 F-100D kit that was produced in at least a half dozen different boxings. Even now, many consider it to be the best F-100D in this scale, even though there has been another kit released by Revell AG about 5 years or so back. That kit is also very nice, but not quite as crisply detailed as this and has an odd additional frame in the main canopy that no F-100D ever had. 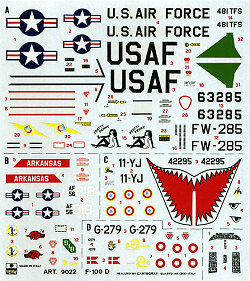 This same kit was the basis for the AMT 1/72 F-100F, using all the same sprues except for the fuselage, canopy, and additional interior bits. Molded in a tan plastic, the kit is very nicely molded with crisp engraved panel lines. There is no flash nor sink areas. However, ejector pin marks can be found on the inside of gear doors, on gear legs, missile bodies, pylons and a few other places. Some will be difficult to remove. The cockpit is relatively barren with but a control stick, seat and instrument panel. Instruments and side consoles are decals. A gun sight sits atop the instrument coaming. The intake is quite shallow as is the exhaust, going back no farther than the nose and afterburner sections. Both type of afterburner can are provided as ANG planes used the less complex F-102 burner can. There are three pylons for each wing with the center one being used for the drop tank. Inner pylon is for the Bullpup or Sidewinder missiles. The Sidewinder missile rails are incorrect as it should look like an inverted Y but is like an inverted T instead. The outer racks have no weapons, so it is up to your spares box to find something. The kit also supplies only the curved refueling probe so if doing an early plane, you'll have to make the straight one. The kit's canopy is a single piece and will need to be cut to show any interior detail. However, since there is little, perhaps it should remain closed. Instructions are quite well done with good drawings and color information in both generic and FS 595 colors where that is applicable. Markings are for four aircraft. One is a silver painted plane from the 481 TFS in Vietnam named 'Pretty Penny' as shown on the box art. An Arkansas ANG 184 TFS aircraft in SEA camo is next. In a similar scheme is a French EC 4/11 aircraft with a huge sharkmouth. Finally, in overall green drab is a Danish 730 Esk aircraft. The ESCI decals are nicely printed though the French roundels are a tad off register. My experience with ESCI decals that are over a few years old is that they will disintegrate when put into water and if coated will be brittle and not respond well to setting solutions. Replacements are recommended. Despite its age, it is still as superb kit and can often be found on vendor's tables at shows for $5-10 dollars, making it a real bargain in today's market. Thanks to me and my digging through vendors tables for this one.